The Miracle Berry, Synsepalum dulcificum, is a fruit that possesses a strikingly unusual property: when the pulp from the red berries coat a person's tongue, everything they subsequently consume tastes sweet. The mechanism by which this occurs is highly unique, but is generally considered safe, with only minimal side effects. The primary side effect of miracle berries are the main reason people go out of their way to eat them - they make everything consumed taste sweet for hours. 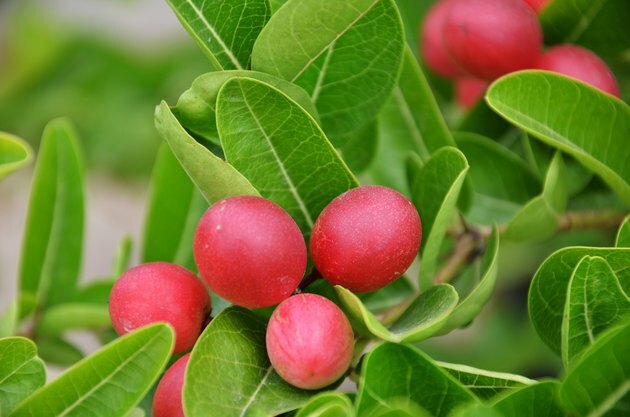 The active ingredient in the Miracle Berry, miraculin, is a protein which binds to the taste buds in the mouth, temporarily altering their function. It does not change the properties of the foods, but affects how the taste buds react to those foods. Scientists don't precisely understand the science behind this, but they do know that miraculin's effect overrides the body's natural response to send signals to the brain indicating when a food is sour, and instead sends signals indicating that it is sweet. Because the berry causes everything to taste much sweeter than normal, one potential side effect is that people could indulge in highly acidic foods in larger than normal quantities, which could be detrimental to their system. For example, since vinegar tastes sweet after eating the berry, drinking a cup of vinegar would no longer be aversive chiefly because of taste. Drinking a cup of vinegar after eating the berry may seem implausible, but not outside of the realm of possibility as "miracle berry parties", where people eat the berry then try all kinds of sour foods for fun, are not uncommon according to the New York Times. Because the miracle berry does not alter the foods themselves, similar to highly acidic foods, spicy foods could potentially be eaten in greater than normal quantities. This could lead to heartburn and other stomach issues. Although studies performed by Florida State University professor Dr. Lloyd Biedler indicate that there are no dangers from eating the miracle berries, the change in taste-bud signaling has been reported to last longer than expected. In rare cases, the taste-bud signaling effect has lasted up to 18 hours. This could be a cause of anxiety for some, although the effect is temporary.There have also been reports of enhancement of other flavors, such as salt, which could be problematic for people expecting a much different outcome. One concern is that because the fruit changes a person's natural tastes, children could be at risk of consuming harmful products if given the miracle berry. Tropical Visions Rare Fruit Review reported that small children are most frequently poisoned by aspirin, but that miraculin was tested and proven not to mask aspirin's characteristically bitter taste.